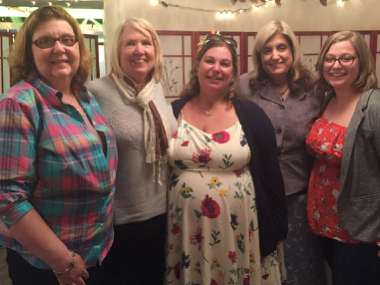 NEPTUNE – Homemade salsa, the Word of God, and a creative spark brought a group of GNJ clergywomen together to write a year-long devotional. The women: Gabrielle Martone, Frances Noll, Vicki Brendler, Francie Preston, Diane Dyson, June Tamburro, Lynn Mears, Jean Arlea Eriksen, Jana Purkis-Brash, and Gina Yeske, call themselves the Salsa Sisters. The Salsa Sisters met as a PaCE group, meeting every month for prayer, communion, and creativity. A peer learning resource for developing turn-around spiritual leaders, PaCE (which stands for Pursuing Clergy Excellence) is an initiative to facilitate peer learning groups that help shape pastoral identity, imagination and develop leadership excellence. The program supports clergy excellence by building trust, reducing isolation, exploring ideas through shared experiences, providing multiple viewpoints, engaging in deep conversation, and in the case of the Salsa Sisters, unlocking creativity. Mears also shared that the women encouraged each other and discovered their creativity along the way. They had fun cooking together, eating, taking creative classes and supporting each other through personal life experiences. The devotion writing project, funded by a PaCE grant, took about two years to complete and was inspired by the lives and faith journeys of the Sisters. The devotional follows the church year and the lectionary. Each week features a different theme and includes daily devotions, recipes, hymns, reflections and photos. When asked what their hopes were for those reading the devotional, the Salsa Sisters had a variety of answers centered on inspiration, connection and joy. Eriksen hoped the devotional would help people have a deeper relationship with God, while Purkis-Brash wanted to inspire those who read it to a sense of creativity in their spiritual lives. In celebration of the devotional’s completion and release, the Salsa Sisters held a launch party with family and friends on August 9 at the Mission and Resource Center in Neptune. Salsa Sister’s One Year Devotional: Sister’s Alive in Leadership, Spirituality, and the Arts can be purchased on ibooks and Amazon.